Driller Blue, meet Dodger Blue! The Tulsa Drillers and the Los Angeles Dodgers held a joint press conference today at ONEOK Field to announce an affiliation agreement between the two clubs. With the agreement, Tulsa will become the Double-A affiliate of the Dodgers beginning with the 2015 season. Special Advisor to the Chairman and Hall of Fame Manager Tommy Lasorda, Vice President of Player Development De Jon Watson, Executive VP and Chief Marketing Officer Lon Rosen and Chief Financial Officer Tucker Kain. The announcement for the Drillers ends a 12-year partnership with the Colorado Rockies. The Dodgers will become only the third major league affiliate for the Drillers franchise. The Drillers were the Double-A affiliate of the Texas Rangers for their first 26 years of existence, spanning 1977 through 2002. They were affiliated with the Rockies from 2003 through the 2014 seasons. "The Drillers organization is proud to announce its affiliation with the Los Angeles Dodgers," said co-chair Dale Hubbard. "The Dodgers are one of baseball's most famous and successful franchises, and they have a great history of developing players within their minor league system. We are very appreciative of our 12-year relationship with the Colorado Rockies, but we are excited about this new chapter in the long history of professional baseball in the city of Tulsa." The affiliation agreement between the Drillers and Dodgers is for an initial two-year period covering the 2015 and 2016 seasons. 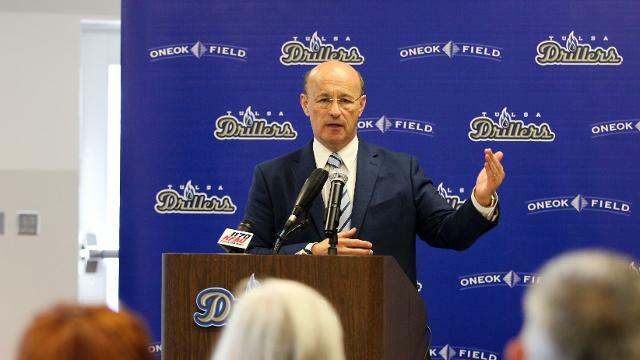 "We are thrilled to be working with the Hubbard family and making Tulsa our home for the Dodgers' double-A team," said Kasten. "Having our top two minor league teams within the state of Oklahoma will certainly be great for our organization and for the Dodger fans in the state." Earlier in the day, the Dodgers announced that Oklahoma City would become the team's Triple-A affiliate. It is the first time since 2002 that the state of Oklahoma's two professional baseball teams will share a major league affiliate. The Dodgers franchise has appeared in 18 World Series. There are over 60 players, managers and executives in the Baseball Hall of Fame who spent some of their professional careers with the Dodgers. Despite the new major league affiliate, the Drillers will continue to play in the Texas League as a member of the North Division. Tulsa will officially open its affiliation with the Dodgers when it begins the 2015 regular season on April 9 by hosting San Antonio at ONEOK Field. According to the book Let's Go Tulsa, authored by Tulsa baseball historian Wayne McCombs, the Dodgers become the 10th different major league affiliate for the city of Tulsa. The old Tulsa Oilers first-ever affiliation was with the St. Louis Browns from 1921-1929. In addition to the Browns, Tulsa has partnered with the Pittsburgh Pirates (1933), Chicago Cubs (1940-1942; 1946-1947; 1956), Cincinnati Reds (1948-1954), Cleveland Indians (1955), Philadelphia Phillies (1957-1958), St. Louis Cardinals (1959-1976), Texas Rangers (1977-2002) and Colorado Rockies (2003-2014).